“Beware the scale trap”. In a Letter To Philanthropists Parker Mitchell, a former CEO of Engineers Without Borders in Canada, advised potential donors that “scale is important, but don’t rush it. Most good ideas take time – to iron out the details, to bring down the costs, to be tested in different environments”. Organic demand-driven scale will happen in time, but it takes patience to find the right elements of a solution. These lessons are exemplified by The Nubian Vault Association (AVN). With a mission is to serve the one hundred million people living in the Sahel region of West Africa who are either homeless, or live precariously in short-life structures, AVN has spent 16-years, on the ground, developing a multi-dimensional approach that works. AVN’s pioneering work will be presented this week at the finals of the Place By Design competition at SXSWeco. Rather than a celebration of the past, it will share a challenge with the whole social impact community: What’s the best way to grow faster – a lot faster – without wrecking a system that has worked well so far? One hundred million people are living precariously in the Sahel region of West Africa. Deserts are spreading, the bush timber they once used to build homes is no longer available; as a result they are forced to use imported wood and corrugated iron to build houses. These modern materials have poor insulation properties, are unhealthy and uncomfortable to live with, and cost cash to purchase that many poor families simply don’t have. The traditional development model is either to give people money or, in social impact design projects, to treat the situation as a production challenge. 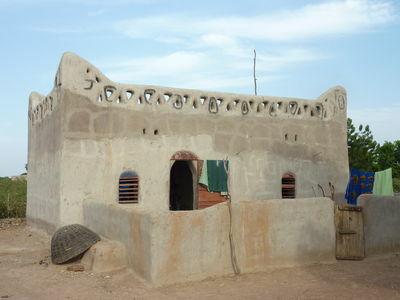 The Nubian Vault Association has evolved a quite different approach: the long-term, muti-dimensional cultivation of living local economies based on three kinds of value: a roof, a skill, and a market. The roof in question is inspired by a building type, the nubian vault, invented by Egyptians 3,500 years ago. Adapted for today’s conditions, these vaulted earth roofs are built with locally-made adobe bricks whose raw materials are free and locally available. 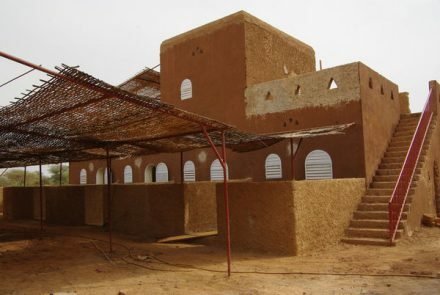 Because nubian vault structures contain no wood, or iron, they are affordable, ecological, and – with their excellent thermal properties – comfortable. They are also durable: AVN houses built more than fifteen years ago are still in daily use and can be expected to last 50 years or more. This compares with an average life expectancy of 7 – 10 years for a house with a corrugated iron roof and thin concrete block walls. Skills are created as the cohort of masons trained by AVN grows. Since 2000, more than 440 masons have been trained, and a growing cohort of apprentices is following in their steps by learning and working on new sites. This transmission of know-how between master and apprentice is at the core of AVN’s approach. AVN has evolved a nuanced approach to the creation of self-sustaining local markets They begin with a demonstration project – for a small mosque, perhaps – and then recruit a dynamic and confident individual to be their ‘ambassador’. He or she looks for new customers among up within a 100km radius of the demonstration project. New customers, as they are found, are connected with a mason. Unlike many architecture-for-good efforts, AVN does not build homes for local people, and has not donated lent them money to do so. On the contrary: new clients usually participate in the construction of their own house and pay the masons directly. AVN’s core objective is to create autonomous local markets that do not depend on external inputs of cash. AVN supports this process with advice on the recruitment of local apprentices, and helps with the logistics and planning of the first construction sites in new markets. Its local teams also organise two to three day congresses at the start and end of each construction season to which all NV masons are invited. They swap experiences and tips, make contacts, and network. AVN also provides training workshops on skills needed to run a small business and become a successful entrepreneur. Right now, a large proportion of new customers are found by the builders themselves.“It’s like priming a pump”, explains AVN co-founder Thomas Granier; “our work expands on the famous saying: we teach a man to fish; we teach him how to mend the nets; we teach him how to sell the fish”. In the language of impact and outputs, AVN’s record is impressive: Masons trained through AVN’s Program have built more than 2,000 homes and other structures for their clients. More than 800 villages contain at least one nubian vault, and AVN offices have been opened in Benin, Burkina Faso, Ghana, Mali and Senegal. Looking ahead, progress, for Granier and his team progress, is not like ramping up production in a factory. 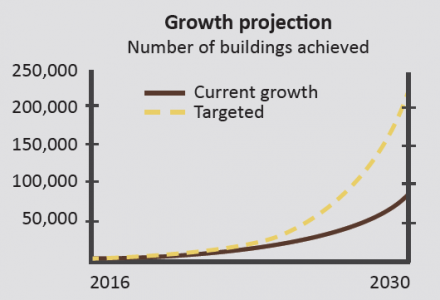 Although the number of new buildings completed has been growing at an impressive 25% a year – that rate would mean the completion of just 200,000 buildings by 2040. Probably ten times that number are needed. A growth rate of 35% would multiply that number by six – to 1,200,000 buildings – which gets a lot closer to the scale of the need. But how? Thre are no easy precedents to learn from. As Tom de Blasis points out in an interesting new book called Leap Dialogues, only a handful of programmes have been succssful at the million-plus scale: vacinnations for measles and rubella; anti-malarial bed nets; mobile phones; and micro-finance. None of these is comparable to building houses. AVN therefore needs to develop an operation that works at a system scale. It needs to figure out what factors determine the readiness of an area to become self-sufficient – its ‘market-readiness’? And to achieve that, it must decide what kind of platform it must become if it is to enable the exponential growth of its approach. Funding is important, of course. It can take AVN staff several months to research and write a grant application. They must wait more months for a decision to be made. And once they have the go-ahead, it takes more time to ramp up activities. AVN’s most important work: curating the exchange of value among multiple actors in diverse and changing contexts. In sixteen years so far, AVN has fostered working relationships between actors in different domains. local, regional and national public authorities; international donors; civil society actors such as NGOs; and so on. The diversity of agendas and cutures invoved in one programme is mind-boggling. During this process, system conditions on the ground have continued to change; AVN must adapt continuously in an environment shaped by changing demographics, migration, armed conflict, and climate change. In traditional development projects, with their clearly defined vendors and suppliers, a legacy support infrastructure exists: laws, business models, financial management systems. AVN, in the absence of a legacy support system, proceeds on the basis of sensitively cultivated trust. A new kind of business model is needed to support this kind of complex long-term system-shaping work. This entry was posted in city & bioregion, development & design, learning & design. Bookmark the permalink. Both comments and trackbacks are currently closed.